Learn more about insurances accepted HERE. Do you have weekend and evening appointments? We have extended hours on Monday evenings and Saturdays. However, these time slots fill up quickly! Schedule Online Today or call our office at 972-801-2727! We cannot guarantee that we will be able to accommodate walk in patients, as we are a medical practice that schedules both yearly routine eye exams and medical eye exams. Therefore we do recommend scheduling your appointment in advance. However, if you are experiencing a medical eye issue and need to be seen the same day, please call our office and we will always try to work you into the schedule! Schedule Online Now or call our office at 972-801-2727. Often, (but not always!) we can fit you into the schedule, so we suggest you call the office to see what we can do about short-notice appointments. YES! We see children as young as 6 months of age. We have a great selection of children’s and teen’s eye glasses as well. We recommend an exam to all children starting at 6-12 months (at the very least by the age of 3) with yearly exams following thereafter. We also participate in the InfantSEE program; Learn More Here. I have a hard time finding frames that fit properly. Do you carry specialty lines? 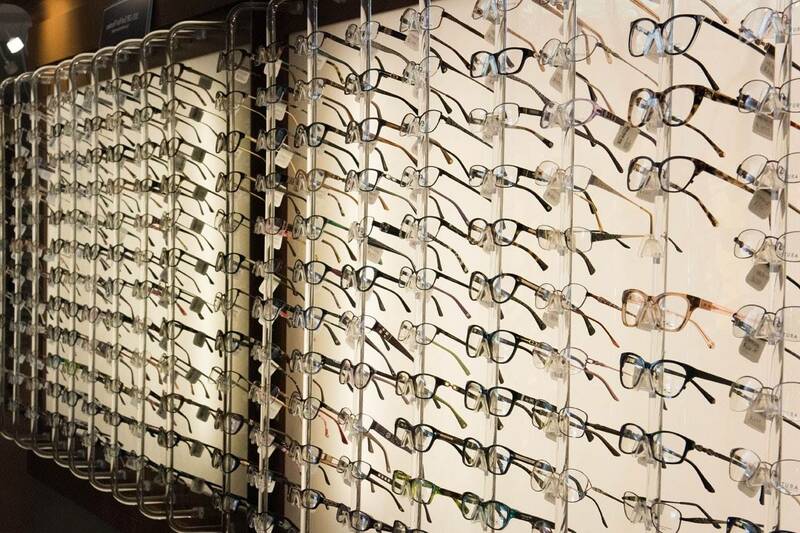 We have a beautiful optical with over 600 frames and an expert optical staff willing to go the extra mile to make sure you leave with a stylish and properly fitted frame. We carry a selection of extra small or large frames, and a variety of plastic frames featuring a global-fit nose bridge. Your Driver’s license and Medical Insurance card (vision insurance companies often do not issue cards). Contact Lens Wearers: please wear your current contact lenses to the exam and bring the manufacturers boxes with you if you have them. Please also bring your backup glasses with you. Glasses wearers: Please bring all of the glasses you are using for various tasks so that we may verify the prescription(s). We generally DO NOT need your previous records, unless you have a medical eye condition or wear specialty/ hard contact lenses. Please let us know if you have any medical eye conditions or wear specialty contacts so that we may request your records in advance. Do you treat medical eye conditions? YES! Optometrists specialize in the care and management of eye disease and vision related problems. Our doctors can write prescriptions and perform in office procedures related to the eyes if necessary. If you have a serious condition that requires referral to a specialist or surgeon, we have a network of trusted doctors that we can refer you to. What is the difference between and Ophthalmologist and an Optometrist? To become an optometrist, one must complete pre-professional undergraduate college education followed by 4 years of professional education at a college of optometry. In optometry school, the student receives education primarily about the eyes and does not receive a comprehensive education regarding the rest of the body and systemic disease processes. An optometrist is qualified to treat both medical and vision issues and can be seen as the “primary doctor” for the eyes. Whereas an ophthalmologist completes four years of medical school followed by a residency in ophthalmology, often specializing in certain parts of the eye (for example the cornea, retina, cataracts, etc) and surgery. Do I need to be dilated at my exam? What does dilation do? Dilation is an important part of a comprehensive eye exam and the standard of care. There is no extra cost for a dilated exam. It is the best way the doctor can give you a thorough ocular health examination. With dilation, some types of pathology can be found in your eyes including but not limited to: diabetes, cataracts, glaucoma, eye tumors, high blood pressure, infectious diseases, macular degeneration, retinal detachment, and vasculitis. With this test, drops are put into the eye and the patient must wait about 15 – 30 minutes for them to take effect. During this time the pupil will open up allowing the doctor to give you a more thorough internal ocular health exam. Once the test is done the patient is often light sensitive and they will have blurry near vision. On occasion, the patient’s distance vision may be affected as well, but most patients are able to drive themselves home with caution.The dilation usually lasts for 4 to 6 hours. We recommend a dilated eye exam yearly for all of our patients, but especially for those who have had recent severe head or eye trauma, who are taking certain medications which could affect the eyes, those with high myopia (very near-sighted), who have certain diseases (such as diabetes) or have a family history of certain diseases or eye conditions (for example, macular degeneration, glaucoma, sickle cell anemia, tay sachs, or retinal detachments). We will inform you of the need to do this test (if you have certain risk factors), and ask your permission before we use any drops. I do not have Medical or Vision insurance, how much does an eye exam cost out of pocket? Our same day payment rate for a routine eye exam is $140. This includes the prescription for glasses and a comprehensive medical evaluation of the eyes. If you also require a prescription for contact lenses there is an additional charge that ranges from $85 to $105 for a contact lens fitting. If you wear specialty lenses such as Rigid Gas Permeable lenses then the contact lens fitting fee could be higher and we suggest calling our office for a more accurate quote. For more information about our contact lens fitting fees please review our formal contact lens policy. Can I get a contact lens prescription without a full exam? Before a patient can be fit with contact lenses, a complete medical and refractive eye examination is necessary. This exam is critical to assure the good health of your eyes and to rule out the possibility of any unsuspected, underlying condition that may prevent contact lens use. I do not have any vision issues, why would I need to come in for any eye exam? The eyes can reveal a lot about your overall health, so having regular annual eye examinations is an important part of your yearly general health checks. Even if you are not experiencing any visual difficulties. Subtle changes in the retina can help achieve early diagnosis of other more serious medical conditions such as diabetes, high blood pressure, and multiple sclerosis to name a few. Signs for these conditions can first show up in the eye and may not be associated with any other symptoms. In Texas the standard of care for prescriptions is one year. Click on a link to read the Texas Board of Optometry’s occupations code. Within 90 days of your order, only unopened, unmarked contact lens vials or boxes may be returned or exchanged. No credit or exchanges are permitted on opened or otherwise altered boxes or vials. Do you offer a warranty on glasses purchased at First Eye Care West Plano?